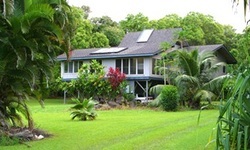 Our family is pleased to present our two and a half bedroom home on over two acres of private land with panoramic ocean views. The house is located between 40 acres of unoccupied oceanfront pasture and over 85 acres of tropical rain forest with views of Mt. Haleakala. Let this home be your haven, close to town and nature. All you need to find peace of mind. The house boasts an expansive 180 degree view of the ocean from the entire eastern side. Design elements of the interior include vaulted ceilings, romantic lighting on dimmers throughout the house, skylights, hard wood floors, and a large tiled lanai. Our kitchen comes fully stocked with cookware and dining ware and includes a full stove/oven, dishwasher, refrigerator and freezer, coffee-maker, microwave, rice cooker and toaster. It also includes a triple reverse osmosis water filter, garbage disposal and filtered ice maker. The living room will comfortably seat the entire family, and is an ideal location to watch the sun rise. Stocked with two comfortable sofas, and several comfortable chairs, it is up to you whether you would like to listen to the ocean, wind, and birds, or relax in front of our cable television and watch your favorite TV show or DVD. 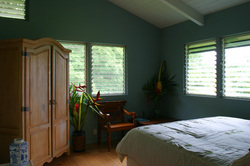 There are two main bedrooms, both of which have king sized Spring Air pillow top Posturpedic beds. 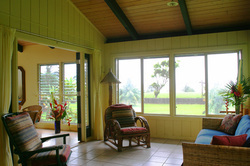 Windows look out upon the jungle of Hana, and provide a romantic setting to relax on your honeymoon, sleep the stress of the world away, create and/or read inspired novels, or simply rest as you get ready for your next full day of all that Hana has to offer. For those needing more beds, the Lanai can be transformed into a third bedroom which has a queen size sofa bed and a queen size futon bed providing comfortable sleeping space for 8 people. 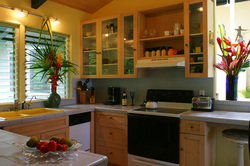 There are two bathrooms located within the main house rental. 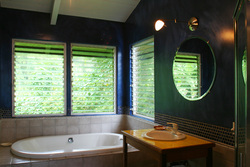 The master bath has a huge two person bathtub, separate shower, and a view of the jungles of Hana. 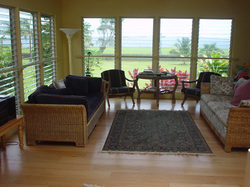 The floors are tiled, and the large windows allow for almost uninterrupted access to the songs of the birds and sounds of the breezes. You've never had a bath like this before! And when you get out, we have heated towel racks to keep your towels hot and dry. Outside is an outdoor shower. The shower supplies both hot and cold water (unlike most outdoor showers that are only cold, this one can be heated to your perfection). The house rental also comes with full access to our washer and drier. 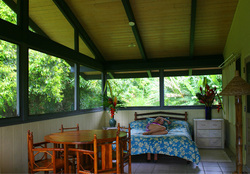 Additional fees for extra bedroom, up to 8 guests.